This rich, satisfying Smoked Salmon Chowder is a creamy, indulgent bowl of tender chunks of potato, bites of savory smoked salmon, and bursts of briny capers. Serve it with some crusty bread (or better yet, in a bread bowl!) for a perfectly delicious meal that your whole family will enjoy! In a large pot or dutch oven, brown the bacon over medium heat until almost crispy, then drain the bacon grease. Add the butter to the cooked bacon. When the butter is melted, add the onion, celery, carrot, and bell pepper and cook, stirring occasionally, until the vegetables begin to soften, about 5 minutes. Add the garlic and cook for 30 seconds. Add the diced potatoes, dill, thyme, basil, paprika, crushed fennel seeds, tomato paste, and capers and stir to combine. Pour in the chicken broth and increase the heat to medium-high. When the chowder comes to a boil, cover and reduce heat to medium-low, then let simmer for 10-15 minutes or just until the potatoes are softened and tender but not falling apart. Add the cubed cream cheese and stir until it melts into the soup. 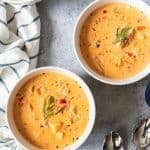 Add the salmon, cream, lemon juice, and hot sauce and allow the chowder to heat just until everything is gently heated through, but don't let the soup come to a boil after adding the cream. Once hot all the way through, taste and adjust the seasoning by adding the salt and pepper, as needed, and adding more hot sauce, if you like. You may not need any salt, depending on the saltiness of your capers and smoked salmon. Serve, garnished with a sprig of fresh dill for presentation and a loaf of crusty bread! Red potatoes or russet potatoes also work, although you may need to add a little more chicken stock for russet potatoes, which are starchier than Yukon golds. I have also made this with leftover grilled salmon with good results, although it doesn't get quite the same smoky flavor from using smoked salmon. The soup can be refrigerated for 2 days and reheated gently on the stove.